Anna del Conte is the uncontested doyenne of authentic Italian cooking. Ever since her first book, 1976’s Portrait of Pasta, revolutionised the British conception of continental cuisine, she has been an endless source of vital wisdom about how to source the best produce, how to most successfully prepare it, and how to capture the vibrant subtleties of genuine Italian food. 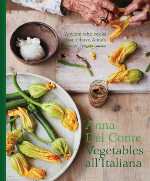 Her new book Vegetables all’Italiana places the flavours and textures of vegetables centre stage. Organised alphabetically, from aglio to zucchina, Anna presents classic dishes that combine signature Italian flavours with her own personal style. Collecting her wisdom and talents developed over her half a century career spent in cookery writing, Anna can teach all old dogs new tricks, and we’re delighted to have her spend an evening with us to share her knowledge and love of food. Tasters will be available on the evening to get your palette tingling, and preparing you to talk all things Vegetables all’Italiana with this living culinary legend.